Takaoka (, Takaoka-shi) is a city located in the northwestern portion of Toyama Prefecture, Japan, and is the central city of its Western District. Takaoka covers the 8th largest surface area in Toyama Prefecture and has the second largest population after Toyama City. Takaoka became a city on April 1, 1889, withdrawing from Imizu District. From its border with Himi down to the southwest area of the city, a range of mountains stretch for roughly 150 m to 300 m with a particularly high stretch of mountains centering around Mt. Futagami near Himi. Shogawa River and the Oyabegawa River run through Takaoka and tributaries weave their way though the city center. Including small rivers, a total of 10 rivers flow through the city. The Amaharashi coast lies to the north of the region. Just off the coast lies the island Otokoiwa. Another island, Onnaiwa, lies nearby and the view of this island against the backdrop of the Mount Tate range of peaks is famous and features in promotional media for the region. A section of the Imizu plains runs from the central district of the city to the eastern district, and the Tonami plains which stretch from the West to the South are dotted with villages in certain areas. The Yomiuri Shimbun newspaper has a branch office in Takaoka. Originally, the Takaoka region was called Sekino, but when Maeda Toshinaga opened the city in 1609, he named it after a verse from the religious poem Shihen which includes the word Takaoka. In addition to this, the fact that Takaoka Castle was built on a slightly elevated shoreline is thought to be another possible origin for the name Takaoka, since Taka means "high" and "Oka" means "hill or elevated land". The present-day suburbs of Takaoka formed the provincial capital of the former Ecchu Province, and Otomo no Yakamochi took position as a government official in this area. During his five-year stay he wrote many waka poems. This is the reason for Takaoka being named Manyo City. Even today the main event at the annual Manyo Festival is the 20 Volume Manyo recital. In 1609, when Maeda Toshinaga of the Kaga Domain entered Takaoka Castle, he officially opened the city of Takaoka. At the time of the opening of the city, it was reorganized for a population of less than 5,000 inhabitants and the Samurai Yashiki (residences) were positioned around the castle and towards the southern plateau. However in 1615, when an edict was passed that there was to be only one castle in each feudal domain, Takaoka castle was destroyed. At the time, people said that cities without castles would fall into decline however Maeda Toshinaga pursued policies regulating the relocation of Takaoka citizens and promoting the development of Takaoka as an industrial city. This resulted in the start of Takaoka’s role as a city of commerce and industry. Takaoka copperware and lacquerware also took off at this time. More recently, on April 1, 1889, Takaoka was registered as one of Japans first cities together with 30 cities nationwide, including Hirosaki in Aomori Prefecture. An Imperial decree in July 1899 established Fushiki Port (now known as Fushiki Toyama Port) as an open port for trading with the United States and the United Kingdom. On November 1, 2005, the town of Fukuoka (from Nishitonami District) was merged into Takaoka. Therefore, Nishitonami District was dissolved as a result of this merger. The tradition of this festival started when Maeda Toshinaga received a float from Hideyoshi, a powerful figure at the time, and gave it to the people of Takaoka. The festival features seven floats, crafted in the brightly colored Momoyama style, which make their way around the streets of Takaoka. The Hikiyama festival in the port town of Fushiki is called ‘Kenkayama’ (fighting floats) by locals. During the day the floats are adorned with flowers, and at night they are decorated with paper lanterns. The floats are rammed into each other to the beat of the yamaga war drums. The Goin festival celebrates the kindness of Maeda Toshinaga who took care of the city’s casters, by worshipping documents with his seal on. During the festival, the Yagaefu dance (a processional dance performed with bamboo sticks) is also performed on the streets of Kanayamachi. A large collection of around 1,000 tanabata of various sizes, including 20 m tall jumbo tanabata, make a large tunnel that serves as an archway into the town’s main street. The Takaoka Tanabata Festival is a symbol of summertime, when the streets are lined with thousands of large tanabata to celebrate the union of Orihime and Hikoboshi, two deities who, according to legend, are only allowed to meet once a year. 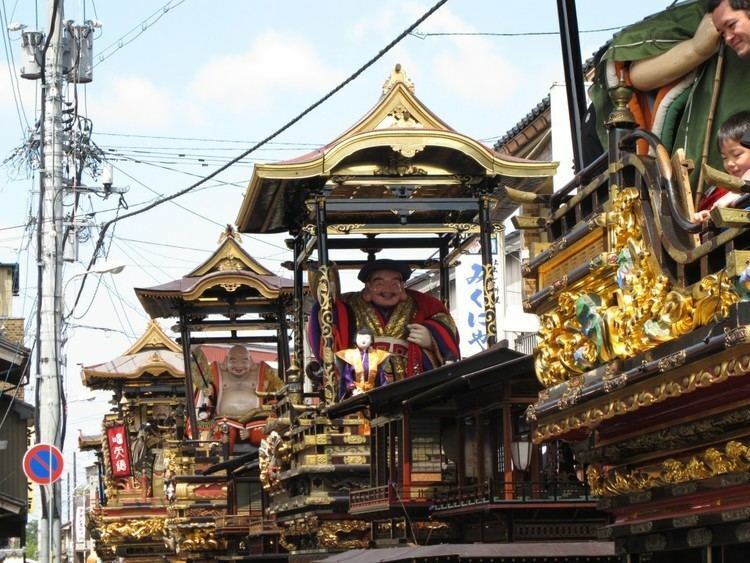 The Tsukurimon festival is a festival with over 300 years of history. Sculptures depicting local sights and famous characters are made out of fruits and vegetables and displayed throughout the town. Depicting current events and famous characters, scarecrows are made using everyday materials such as straw and wood and displayed around the main shopping area of the Nakada district. This major autumn event celebrates the Manyo tradition with a marathon poetry recital lasting three days and three nights. The entire Manyo poetry anthology is recited by a large number of participants in a relay fashion. Fresh fish and shellfish from the Sea of Japan are cooked in large cauldrons made with local casting techniques.